I want to introduce you to my kitchen garden. I live in the suburbs of a Rhode Island city. Plot size varies in my neighborhood between 5,000 to 10,000 square feet. I have the former, which once you account for the house, garage and driveway and a little patch for the dog, doesn’t leave much space for growing food! I have typical urban agriculture problems. I have more shade than I would like, a pine tree dropping acidic needles all over my backyard beds, neighbors that are too close and a garden in the front that gets the best sun but that I have to keep “pretty.” It’s challenging to say the least but I am constantly amazed at what I can do with what I have. 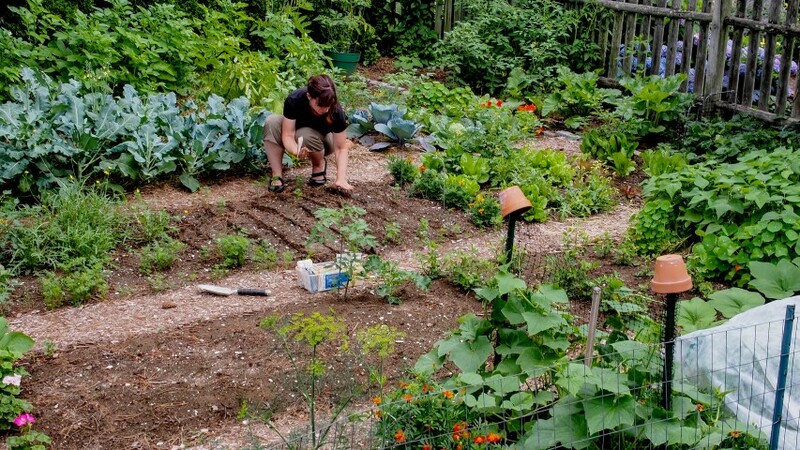 Each year my fruit and vegetable beds expand, the soil improves and the yields are better. I’ve learned how to use the shade to my advantage and to maximize every last square foot of growing space. I’m always looking for new ideas and new skills to learn. Now the back beds are under control I can focus on the front of the house. Boy, do I have plans, but that’s for a future post. I see a change in the neighborhood. As I walk along the streets with my dog I get glimpses of container gardens and raised vegetable beds in backyards. Some are boldly planting right in full sight of their neighbors – my heroes! I see tomato plants, kale and beans among the flowers. There are rumors of chickens and bees. It brings me joy to see it. My family will never be self-sufficient on this patch of earth but each year I bring us a little closer. For me, the reward is found in the learning along the way and the food on our plates and in our pantry.